Lake Griffin Harbor is a 55+ community near Ocala, Florida, that currently has an excellent selection of affordable mobile homes for sale. In addition to pre-owned homes, many of which are available fully furnished and move-in ready, we also offer new homes in several different floor plans built by Jacobsen Homes, which is the leading builder of manufactured homes and modular homes in Florida. The Birch – This model features an open living concept with a kitchen island that’s great for entertaining, as well as a large master bedroom walk-in closet, front porch, and carport. 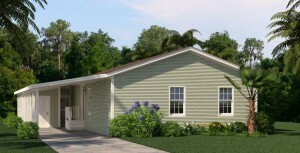 Like The Crepe Myrtle, The Birch has 3 bedrooms, 2 bathrooms, and 1,344 sq. ft. of living space. Whether you buy pre-owned or new, you will benefit from living in a welcoming lakeside 55+ community where you will be able to stretch your retirement savings to the fullest. Lake Griffin Harbor isn’t just a place to live … it’s a lifestyle. In addition to our quite affordably priced new and pre-owned homes, we have a wealth of resort-style amenities and an unbeatable location right on the southern edge of a 9,400-acre lake – the beautiful Lake Griffin. Our community has long been a magnet for people 55 and over who enjoy spending time on or near the water. For more information about Lake Griffin Harbor and our mobile homes for sale, please contact our Lifestyle Team today. Tours of our 55+ community near Ocala, FL, take place 9 a.m. to 4 p.m., Monday through Saturday, and 11 a.m. to 3 p.m. on Sunday.